In this March 24, 2018, file photo, students from Marjory Stoneman Douglas High School, including Emma Gonzalez (C), stand together on stage with other young victims of gun violence at the conclusion of the March for Our Lives rally in Washington, DC. The Parkland students who created an international movement to raise awareness for gun violence after a deadly school shooting were awarded the International Children's Peace Prize on Tuesday. 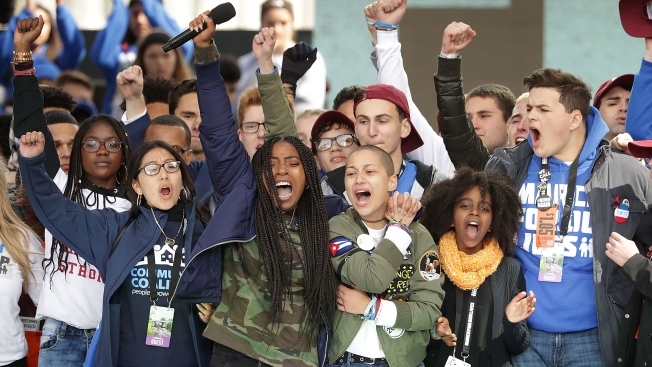 During a ceremony in Cape Town, South Africa, Archbishop Desmond Tutu presented the award, calling the student organization March For Our Lives one of the most significant youth-led mass movements in living memory and its founders "true change-makers." "I am in awe of these children, whose powerful message is amplified by their youthful energy and an unshakable belief that children can — no, must — improve their own futures," Tutu said. In the moments after 17 of their classmates and teachers were killed at Marjory Stoneman Douglas High School, David Hogg, Emma Gonzalez, Delaney Tarr, Ryan Deitsch and Jaclyn Corin and more than a dozen others sprang to action, doing countless media interviews, grilling lawmakers about gun reform during town halls, and sparking massive walkouts and peaceful protests at schools across the country. Matt Deitsch, a Parkland alumnus whose two younger siblings were students at the time of the shooting, immediately left college to help form March For Our Lives. Hogg, Gonzalez, Corin and the Deitsch brothers were in South Africa to accept the award. Gonzalez said the award "serves as a major reminder that the universe is on the side of justice and that we will win because our cause is one of peace." Manuel Oliver, whose son Joaquin was killed, also spoke during the ceremony. The group was joined by two students from Chicago Strong, a youth-led initiative to end gun violence in their hometown, who have worked closely with their cause. Since the Valentine's Day massacre, the students have gained international attention, raised millions of dollars from the likes of Oprah Winfrey and George Clooney for their grassroots movement and made a slew of television appearances. Hundreds of thousands attended their Washington, D.C., march this spring to raise awareness about gun violence and advocate for safer schools. Many of the students have called for a ban on assault rifles and universal background checks. The organization says more than 25 states have passed legislation consistent with their cause, including Florida. Over the summer, the students hit the road, visiting 80 communities in 24 states to help register young voters and spread their message about gun violence. Their tireless efforts even landed them on the cover of Time magazine. Marc Dullaert, founder of KidsRights and the International Children's Peace Prize, said the students "transformed a local community protest into a truly global youth-led and peaceful protest-movement." In Parkland on Tuesday, a charity group pledged $1 million to create artworks to help the community heal. Bloomberg Philanthropies said it's making the grant to Parkland and Coral Springs for their project, "Inspiring Community Healing After Gun Violence: The Power of Art." Five artists and teams will create temporary projects for public display. Community workshops and talks will discuss using art for emotional healing. Most of the 17 victims were from the cities. The charity was founded by former New York City Mayor Michael Bloomberg, who started the news agency bearing his surname. He has been an outspoken supporter of groups with the goal of decreasing gun violence. Associated Press' Terry Spencer contributed to this report.